CIUDAD JUÃREZ – This border city, forced to its knees for so long by drug violence, is slowly getting back on its feet. Once famed for its nightlife and frequented by Hollywood stars – and more recently demonized as the world’s deadliest city – Ciudad Juárez is struggling to remake its image to its residents and the world. The city’s modest revival can be seen in the remodeling of storefronts downtown, along a newly created pedestrian avenue in the historic center, at the packed outdoor markets where locals shop for trendy clothes, in the crowds lounging around the city’s historic plaza on a sunny weekday morning. Mayor Enrique Serrano says the city government has secured more than $225 million from the Mexican federal government for redevelopment projects to remake key areas of the city, most notably a planned rehabilitation of the shabby historic downtown, but also a new convention center and a hospital, road repairs, new street lamps, public pools and neighborhood parks, and a new rapid transit bus line. Serrano finishes a sentence: The plans sound so ambitious “as if it was a lie.” Or as if the city now hopes to do all it could not do during the worst years of shootouts and massacres. Changing how people see the city “is a question of time and work,” Serrano said. Murders have dropped dramatically in a city known up until recently as the world’s most violent. The traditional flow of visitors to Ciudad Juárez from New Mexico – of families traveling to reunite with relatives, of party-going college students looking for a good time, of tourists curious for a taste of Mexico so close to the U.S. – all but stopped as Mexico’s drug war heated up in 2006 and the city became a violent focal point. In a three-year period through 2010, during which criminal organizations battled for control of this key entry point to the lucrative U.S. drug market, more than 10,000 people were killed in Juárez, according to Chihuahua state statistics. Widespread extortion and kidnapping financed a bloody turf war and drove tens of thousands of residents out of the city, many to towns in New Mexico and Texas. Then, the mayhem began to subside. Homicides dropped to under 500 last year from more than 3,000 in 2010 – a rate now comparable to some U.S. cities. Other crime indicators like kidnapping and extortion have plummeted. Things have gotten good enough that the new city government plans an ambitious makeover of the historic downtown and a popular entertainment district known as the Pronaf, while the tourism department plans to hawk the news of Juárez’s recovery from El Paso to Santa Fe and Albuquerque, despite the mayor’s stated disinterest in marketing campaigns. A tourism outpost is planned for the El Paso Saddleblanket store on I-10. The city may still have a long way to go, but its residents – and an adventurous few tourists – have returned to its markets and bars, malls and museums. That’s in part thanks to the success of the city’s first effort: convincing residents to shed their fears and return to their normal lives. The city circulated a video last fall meant to rekindle residents’ pride in themselves and their troubled border city. The video – which opens with hard-working Juárenses rising at dawn and shows all the best aspects of the city’s industry and culture – made the rounds of social media. Rich Wright, an El Paso-based writer, began advertising walking tours to Juárez a few months ago. 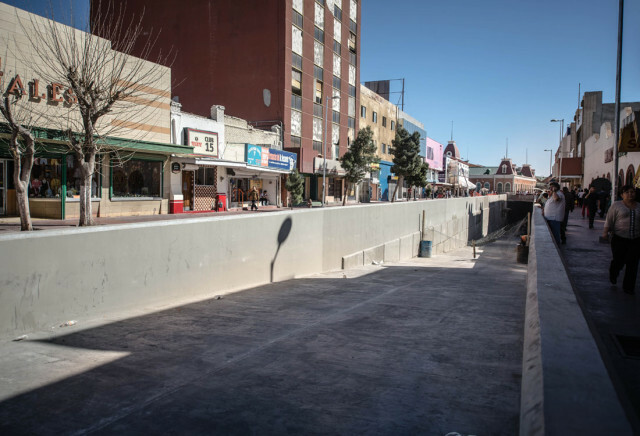 He has guided a handful of people on tours of Juárez’s history and its bars and says he is skeptical of the city’s urban renewal plans – of its ability to follow through and its commitment to preserving the city’s historical areas. A seedy downtown district known as the Mariscal, famed for its bars and brothels, has been torn down. On a recent walk, Wright pointed to a small, newly paved square ringed by abandoned, half-demolished buildings – where there is no sign yet of new construction. A few streets over, a different remodeling project offers a bright spot. “You can no longer compare (Juárez today) with the turbulence, the chaos,” Carlos Rocha, an attendant at the Museum of the Revolution at the Border, says of the recovery. Housed in the stately former Mexican customs building and remodeled in 2011, the white-walled galleries feature memorabilia of the life and times of Mexico’s revolutionaries, especially Pancho Villa. On Sundays, the museum hosts puppet shows for children. On the newly paved pedestrian walkway of Avenida 16 de Septiembre, Joel Alberto Rivera manned a cart loaded with jugs of agua fresca – drinks of pineapple, cantaloupe and milky horchata. The city is building tunnels to push vehicles below ground in the congested downtown. People now stroll the wide avenue in peace.